"America was born in the streets." 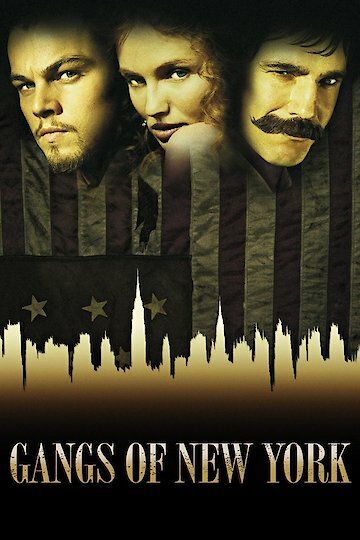 Gangs of New York is a great film which showcases what happened to several people back in the late 1860's. This film showcases a historic look at what sort of happened in the 1860's where somebody is killed and somebody goes after him. You will find the story to become quite scary because even if it isn't a completely true story, the movie showcases what most people used to do back in the day. The movie stars Leonardo Decaprio, Cameron Diaz, and many other special celebrities, so you will find Gangs of New York to be quite a good film with a wonderful story and acting. The acting in the movie is outstanding with a great plot to complement the actors. Amsterdam Vallon discovers that his father is ruthlessly killed. Amsterdam then struggles living without his father, but then he tries to seek revenge because of what they did. This makes him get extremely mad and annoyed, not to mention really tries to kill all the person who killed his father. Bill Cutting is the guy who killed his father, so Amsterdam finds his way to him through a series of events, fights, and many scary scenes. The story quickly evolves from scary crime to attaining revenge. The movie is delivered very well and showcases what most people will really do to some people to seek revenge. Revenge alone is often considered as not worth doing, but sometimes there are moments in life where revenge does has its place, whether it'd be to bring them to jail or kill them. In Vallon's point of view, he knows that Cutting deserves a good killing, so he strives to get him down there and killed as soon as possible. The story truly continues on and gets better from there as the revenge is being done. Gangs of New York definitely takes the story of crime and fight into a new level because of the need to take the story to the 1800's. The movie is very well structured and showcases a story that most people don't often hear. If you want to watch a crime-thriller movie, this is it. The story is heartbreaking, scary, and incorporates a whole lot of action that other movies often neglect to add every single time. With the big time actors in this film, you will enjoy this movie. Gangs of New York is currently available to watch and stream, buy on demand at Amazon, Vudu, Google Play, FandangoNow, iTunes, YouTube VOD online. Martin Scorsese will adapt his award-winning film to your television, focusing on 19th century gangs in cities like New York, New Orleans, and Chicago.